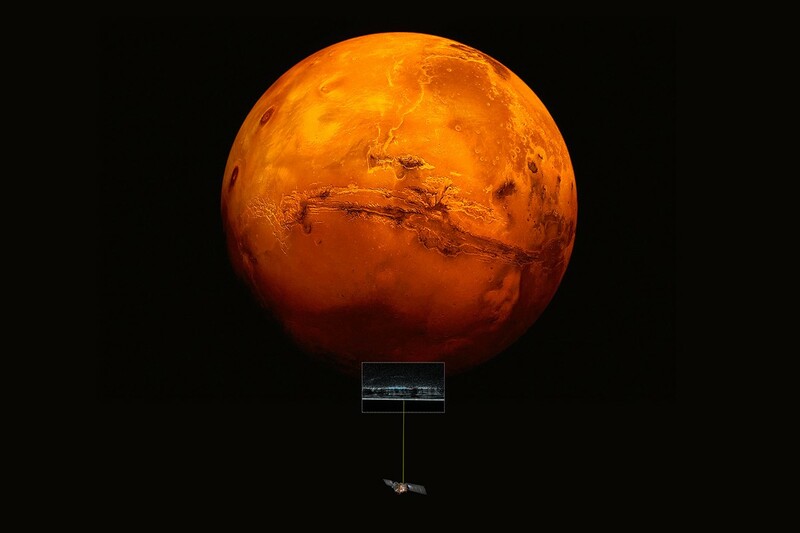 MARSIS detecting the underground lake on the red planet. Billions of years ago, Mars probably looked a lot like Earth. It would have been warm and covered in several bodies of rippling, liquid water. Since then the planet has become arid and toxic, in no way being able to host human life without our protective suits and domes and water supply. Up until now we’ve thought that all remaining water on the red planet was either floating in its atmosphere or frozen at its caps. In 2015 we even found recurring slope linae that might have contained salty liquid water, though these streaks on the planet’s surface were small, seasonal, and thought to be just sand instead of the water we were hoping for. However, a few days ago, Italian researchers looking into the data from MARSIS concluded that there was in fact a 20 km wide lake about 1 mile below the surface of some ice. MARSIS is an instrument on the European Space Agency’s Mars Express orbiter that uses radar to look beneath the planet’s surface the way we might use radar to detect planes here on Earth. These radio waves get sent out and the pattern they create once bouncing back gives us an idea of what lies in that area. The MARSIS even allows scientists to use the data to figure out some of the properties of whatever it is they’ve detected. In this case the waves reflected off of a very bright object in the same way they’d reflect off of a boundary between ice and liquid water. These areas were especially unique considering their surroundings were very dull in comparison. At first the scientists believed it was a layer of frozen CO2 but after checking their measurements with measurements from areas known to have C02 build up, the signals turned out to be very different. The researchers attempted to disprove the liquid water theory several times, analyzing and reanalyzing data for three years before coming to their conclusion. They also suggested the images might be extremely pure water ice but the numbers didn’t show the right density for that to be true. “I think, we’ve done a good job in trying to kill this idea, in the sense that we have been trying to destroy the possibility that it was water many times. We are quite convinced now, and we hope to be more convinced in the future with other data.” Elena Pettinelli, Roma Tre University. 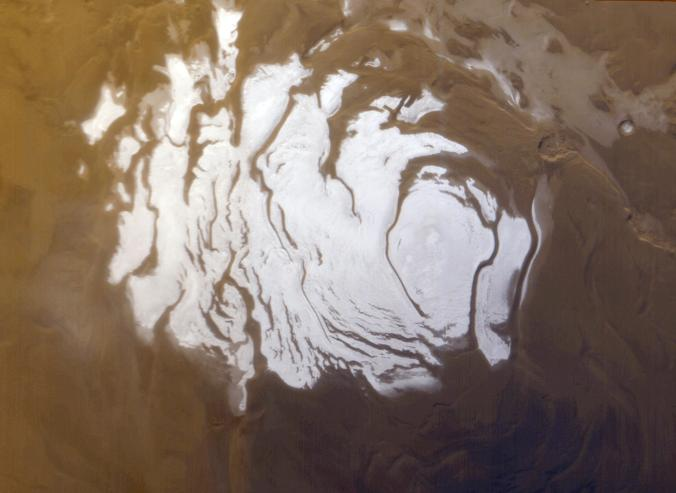 In 2007, another team using MARSIS saw the same images from the radar but were reluctant to believe it was a liquid lake because the temperature at Mars’s south pole is far too low to host liquid water. The temperature reaches around -90 degrees Fahrenheit so it is thought that the water we’ve discovered must be full of salts to lower its freezing point. These wouldn’t be regular table salts, either. Mars is full of perchlorates, toxic to us but also capable of lowering the liquid’s freezing point by about 103 degrees Fahrenheit. Mars’s south pole where the lake was found. This saturation of salt and sediment would mean it was less like a lake here on Earth and more like a sludge or a brine, providing a very harsh environment for anything to grow. According to astrobiologists, it should be too cold and too salty to host life (although there are microbes here on Earth that feed on perchlorates and these microbes could survive for millions or billions of years if they were preserved in ice). However, there is hope — if there’s a heat source under the surface that’s keeping the water liquid, that would be a much better environment for life. Essentially, this discovery does not mean that life on Mars is a certainty; it provides both new hope and new obstacles. But provide new possibilities it does and with them, a better understanding of Mars’s history and evolution. Up until now we thought liquid water vanished billions of years ago from our neighboring world. Even the data of that area didn’t show anything exceptional at first — just more volcanic rock. There’s also the fact that the radar doesn’t have great resolution so there could be more patches of water that we haven’t seen yet. There’s no reason to believe this lake is unique, according to researchers. For those looking to explore and colonize Mars, a huge lake of water would mean sustainability. They could save room by not having to bring their own supply from Earth and they would have a fuel source at their disposal. But to drill 1 mile beneath the surface on a new planet is a prospect that requires new technology, more money, and certainly several more years.